This is one book that I did not look forward to ever reading; I do not recall what possessed me to add it to my reading challenges. I had an idea what the plot was and declared that I had no interest in it. Then it was time for me to read it, and I am so grateful I did. A group of British school boys survive a plane crash on a desolate island, as they are being transported somewhere safer than war-torn England. They are between the ages of 6 and 12. As you would imagine, these boys must come together and exist within this wild environment, without adult supervision or instruction. There are four major characters: The one who is elected to become the main leader is attractive and exhibits moral law and order - ideas that humans are drawn to. Another boy agrees to be leader of the hunters, as he exhibits action and power, physical traits that also attract humans. There is another boy who is intelligent and wise, and has all the answers, but he is physically unpleasant and socially an outcast. 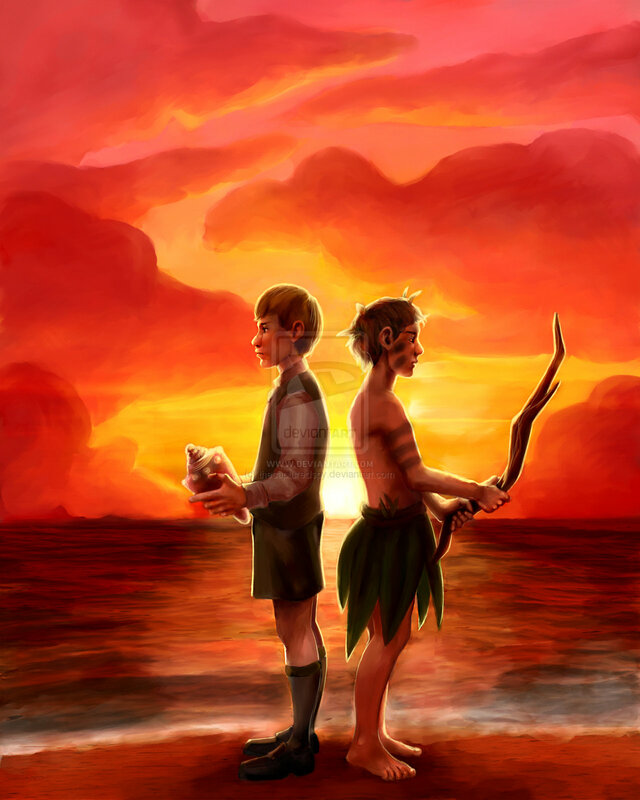 And finally, there is one other boy who is naturally gentle, peaceful, and compassionate, and connected to the natural environment of the island. No one truly understands him, and he is somewhat of a loner. Other characters include a set of twins who are inseparable and easily exploited. They are not unique individuals. Another boy, part of the group of hunters, is vicious and violent. And there is a group of younger boys, age six, who are dependent and need to be looked after and taken care of. They are completely helpless on their own. There is major conflict between the leaders. Moral Law and Order has one objective - to keep a fire smoldering in order to be rescued; but Power has its objective - to kill and eat and subdue the island (and everyone on it). It is obvious to the reader that without law and order there is chaos, destruction, and eventually unnecessary death. And this is what we are faced with: evil Power overrides Law and Order. Now I understand why Oliver DeMille called Lord of the Flies a broken story - when evil is portrayed as bad, but evil still wins. Soon an imaginary Fear is introduced into the story that begins with the younger boys. Internally, they suppose there is a beast living on the island. The older boys believe it, too, especially after they discover a dead paratrooper hanging from some trees high in the mountains. Only the Peaceful character encounters the truth and wants to tell the rest that the beast is not real; but he never gets to tell them. However, that Fear continues to be used throughout the story to encourage the other boys to join evil Power, to hunt and kill. 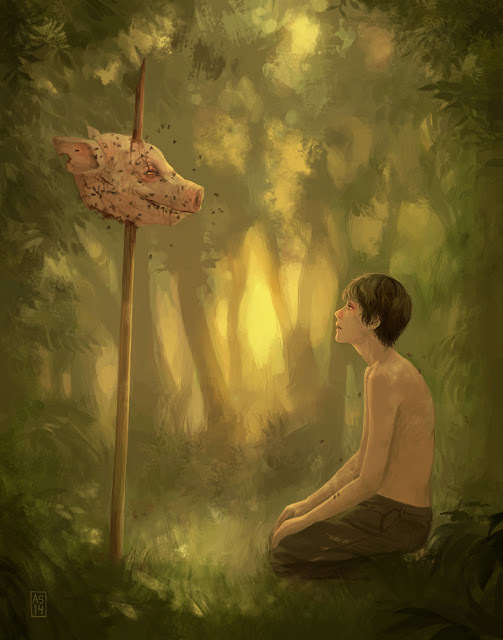 Later, after a hunt, the leader of the hunters raises the severed head of the sow on a stick, and it becomes the Lord of the Flies. It is a shrine to the imagined beast on the island. Since a beast did not really exist on the island, the Lord of the Flies represents the natural beast within, which is evil and wicked. Each major character represents a true picture of human nature. Man desires moral law and order, particularly because he knows man's heart is broken and bent on wickedness. Naturally, man is corrupt and corruptible. Law and order protects man from his wickedness or the wickedness of others; for if man were naturally good and right, he would not need law or order. Man is also attracted to power, and some would say violence. It does not mean we all are. The character connected to peace in The Lord of the Flies was naturally good and harmless. He was not attracted to the violence and rage. He was not connected to an aggressive nature. But the power exhibited by the leader of the hunters was magnetic to the others and brought about their own wickedness. By the end of the story, Power destroyed Peacefulness, Wisdom, and was seeking out Law and Order, to end it once and for all. Just then, a military officer appeared on the island to rescue the boys (the military saw the smoke from the fire, which was only set in wickedness to "smoke out" the main leader from hiding). The irony is that the adult rescues the boys from their violent games; while the adults are at war, too, with each other. Who will rescue the adults from their violent war games? The reason why I liked this story so much is because it is loaded with many truths. It is also very frightening when I consider how true to life it is. And sadly, often times evil Powers do win over goodness, mercy, truth, righteousness, and law and order. Civilization is being destroyed right before our eyes, as man is obeying his own beast. 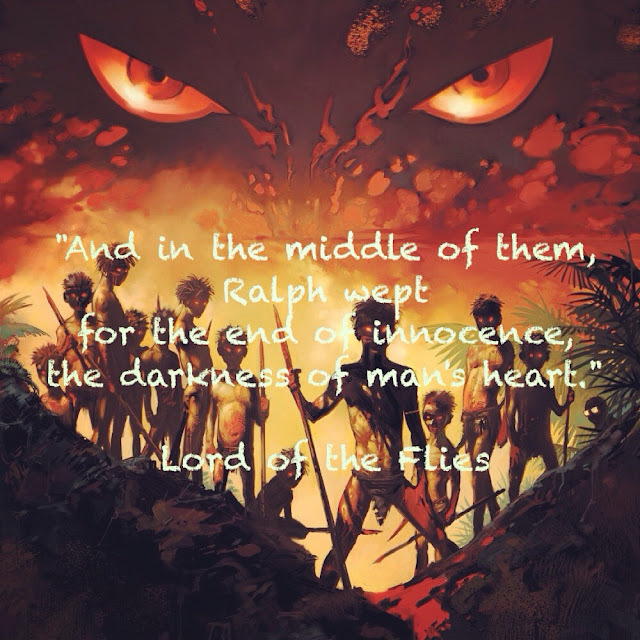 You see, the truth of The Lord of the Flies teaches us that there is never really any end to the struggle between moral law and order and violence and evil power, even within ourselves. The question however is: who will we permit to win? I was waiting for your to finish this book and then I couldn't wait for your review of it. I read it in high school and completely missed all the points and I really need to read it again. I read somewhere that Golding was responding to a belief of his times, that all children were morally "pure" and that it was people and society who corrupted them. He wanted to show that left to their own devices, they could be as cruel or crueler than their adult counterparts. Would you say that's accurate? In any case, what a great review! I really need to put this book on my list for next year. 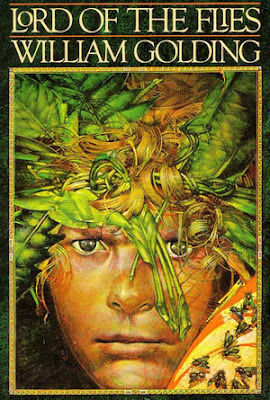 I do love how Golding added the character who was compassionate and connected to nature b/c not everyone is outwardly wicked and evil in thought and deed. None of us are good according to God's standards, but not all of us are drawn to wicked, evil rage and desperate for power. There are so many different human traits, and Golding demonstrates those differences here. The thing that grabbed me most is that evil won all the way in this story, and it really affected me b/c I do see evil winning a lot of the time. It's not everything, especially in small examples, but sometimes it is just easier to see how goodness and righteousness are painted as evil and evil is becoming the accepted good. Of course, Scripture tells us that what is good will become evil and what is evil (according to God) will become good. So that belief that Golding was responding to in the 1950s is alive and well today. Everyone wants to defend children as sweet and innocent and affected only by their bad environments, but I definitely see children as naturally selfish, self-centered, and greedy, even drawn to a gang mentality (as portrayed in this story). It is law and order that teaches us to suppress that natural behavior that wants us to be rebellious, angry, violent, greedy, gluttonous, vile, or care only about ourselves - whatever our vice may be. It really is a great book to read for discussion in a classroom. I think I need to read it again someday. I read this last year and loved it! I didn't really know anything about the story but I'm glad I didn't as it made it much more interesting for me. I like doing that, too: entering into a story without knowing a single thing about it. This story I did know a little about the plot, but not the details. I read this so-o-o-o long ago (when I was a dimwitted adolescent), but I do not think I would read it again right now (i.e., I don't want to spoil my memories). As I am now launched into a different kind of reading -- please see my blog (Shakespeare in the Library), I may not have time for LOTF for a while, but your superb posting persuades me that I need to get around to it someday (in spite of my misgivings about altering memories). So is Shakespeare in the Library the same as Crimes in the Library? I read this as a kid and I loathed it. But I'd really like to re-read it now because it's a huge influence on one of my favorite shows, Lost. In fact, just reading your description, I was like, "Okay, so Jack is the one, and Sawyer is this one, and Locke is this one, and then who's that one? Oh, of course, Hurley..." So yeah, really intrigued to go back to it now. I think I hated it as a teen because it felt so possible. Let kids roam free, and they'll turn into this? It felt like they would. Isn't that scary and true? When I went to high school, which was huge, I saw it happen often. Some groups of kids took advantage of others, and there were no consequences. I know this is very real. Even nice kids could get caught up in the gang mentality, like so many of the other characters in the book. About the show, Lost: I have only heard about it. So I wonder if they used the book as a foundation for the show. They directly and indirectly referenced this in several episodes, though it's not one of the books specifically mentioned by the show's creators and writers as an influence. The idea of survivors on an island dealing with the breakdown of traditional roles and rules and needing to create their own is all there, though. Thank you. Golding is also a pretty good writer. I enjoyed reading his work, considering the topic. And so far I am also enjoying Grapes of Wrath, though the language at times is raw.